If you were going to build a custom Heavy Gun (40-60lb) for 1000 yard BR, where you can have magnums with brakes or small stuff, what calibre and bullet would you go for and why. I am genuinely intrigued as my Dad and I have played for the last year with a few calibres at this and wondered whether you go for an easy to shoot small calibre or a big boomer. The deal is 10 shot groups, so the rifle must be able to shoot them quickly in 30 seconds and not get overpressured by excessive heat generation. I think you answered your question at the last shoot - 9 inches with a 6BR? Barrel life must also be taken into account - burning large amounts (WSM amounts) will seriously burn the throat with ten-shot groups in a frighteningly short time - if it's around 450 rounds with 5-shot groups, what will it be with ten? The 6mmDasher still holds the World Record for five, 10-shot groups. Wait until Norma make the Dasher brass later this year and go for it. You can be ordering the reamer meanwhile - no-turn neck, 105gn VLD Berger. Thanks Vince, the 6BR sure is nice, but I wasnt sure if we had missed something. The 300WSM isnt cutting it yet, and as you say the barrel will be toasted soon I suspect. The Dasher does tempt me, especially if brass is easy to come by. Question is how much extra umph will it get me over the standard 6BR? During load development I had the 6BR up to 3100fps. I had wondered about some form of hot 6mm or a 6.5??? If Dasher brass becomes available, it's got to be the best option IMHO. I note that Norma is now reported to be manufacturing 6-Dasher brass which makes life a bit easier compared to fireforming everything Bruce. It's an interesting question. How much recoil / disturbance did you get with this weight rifle in its .300WSM guise? I ask as you can presumably run something with a bit more oomph than in a Light Gun and the theoretical ideal must be something with the best ballistics that won't disturb the rifle set-up. Or, then again is this issue akin to smallbore match rifles where even the humble low pressure, low energies .22LR is intrinsically more accurate in a stiff heavy barrel rifle as any cartridge creates harmonic disturbance. In this case, it becomes the lowest performance number that is capable of keeping a high-BC bullet well out of the transonic zone at 1,000 yards, ie where it's still moving at 1,400 fps or more. Running the 105gn Berger Hybrid through Berger's Ballistic program, at 2,850 fps 6BR type MVs (for most of us anyway ) it's 1,439 fps at 1,000 and 7.6 inches drift per 1 mph true 90-deg wind change. The Dasher using Reload Swiss powders should have little trouble getting to 3,150 fps and I wouldn't be too surprised at another 100 fps on top. At 3,150 fps MV you're getting an estimated 1,653 fps at 1,000 and wind effect reduces to 6.5 inches. At 3,200 fps you're almost still moving at an astonishing 1,700 fps the wind effect goes down to 6.3 inches. Throw in a bit of trimming & pointing as the Hybrids usually have rather large meplats and the figures improve again. I don't pay that much attention to what people are saying about the sixes these days, but I have the feeling that US mid and long range BR competitors are much taken with this bullet. the one question mark seems to be twist rate - there are some who believe it needs a faster twist than 1-8" to give its best at long ranges. Running it through Berger's ballistic stability calculator, 1-8 at 3,200 fps = marginal stability at 1.41 Sg which the Litz prog says you lose 3% of maximum BC. 1-7.5" raises the Sg to 1.61 and full stability. (The latest thinking says 1.5 and above wanted.) That's at 59-deg F (it's never colder than that at Diggle is it? ) and throwing in 900 ft ASL to reduce atmospheric pressure. 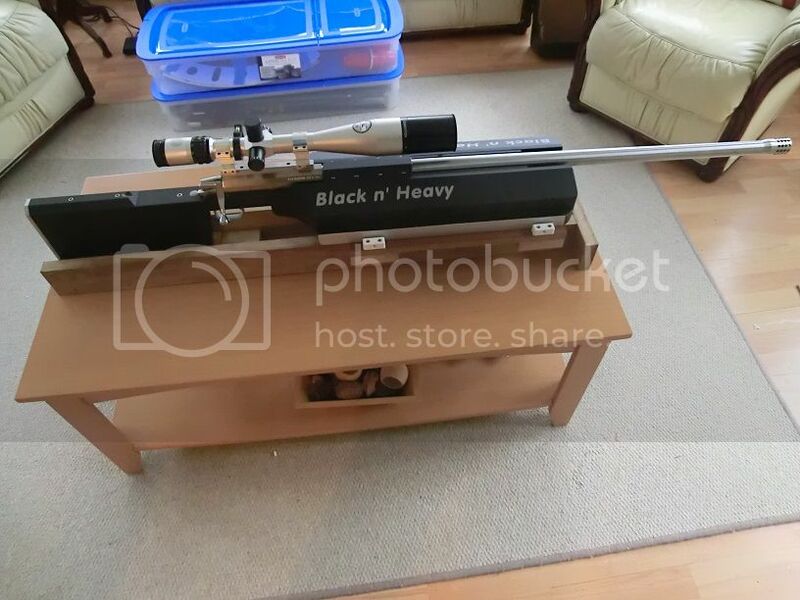 6mm Dasher for me and an awesome 1000 yards bench rest as long as you keep them all on the target Any way as for forming the brass i have a spare hydo forming die here not needed in fact ill stick it in the for sale section as well. Hi Guys, thanks for the input, the 6mm Dasher certainly seems like a good option. I am happy with the 6BR, but I know that my Dad is struggling with the 300WSM. Laurie, the recoil and disturbance doesn't seem to be a problem with the weight of the rifle, they track nicely and come back onto point of aim with virtually zero movement on the rest required, hence why calibre doesn't appear to be a restriction so much as in the Light Gun class. The advent of quality factory 6mm Dasher brass that doesn't need to be formed is certainly making the Dasher look like a very possible contender. I had just wondered if we had forgotten or missed something else that would have set the world on fire, but I have to admit every time I consider it I do seem to keep coming back to something 6BR based in one form or another. Did you get any 'feeling' that 40-50 lb might be counterproductive for lighter recoiling cartridges -just too heavy? Or is recoil so slight then that it is vey fast to slide (heave?) back onto target? Runners go for shots fast (hoping steady wind-5 secs/shot) Pickers (old way-wait for same wind again). Oh,and move to Missoula,Montana where the 6BR/Dasher does very well.....simples. Have a word with Brian Fox Bruce. He puts small to medium order into RUAG Ammotech which is the UK Norma importer. Timescales though? - they're often really slow. With Norma prices, Lapua brass and Spud's hyrdraulic forming die might actually be cheaper as well as a lot quicker! Thought about 6XC Bruce ? It will do all the dasher will and maybe a bit more. 115 grain bullets at the same speeds as a dasher,s 105,s ? Its a proven accurate cartridge, and Norma make brass, and its available. I though the new Berger 105's are ballisticly better than the 115's? 60 lb rifle, brakes allowed,,,calibre limit ? 338 Lap Mag and 250 / 300 grainers. 7mm Shehane and 180 Hybrid? They are or at any rate the 105 Hybrid is only 0.001 G7 BC lower than the 115 Berger VLD, so let's say it's a match. But it can be drive faster of course. It has a higher BC than the 115gn Tubb DTAC. Laurie, thanks for the clarification. Thanks for the ideas, it would appear that the 6mm seems to be the way to go potentially. Dave, I hadnt thought about the 6XC, but having just run some numbers through quick load it looks nice. So far we have tried 284Win, 300WSM and 6BR, the 6BR has been the best so far (with a tried and tested combo of N150 and 105gr VLD's) and we will keep this one, but the 284 and 300WSM have not performed as well as we had hoped. I have had the 284 barrel re-throated from 168gr bullets to 180gr VLD's so will have to play with that. In the 300WSM we have played with 230gr Hybrids, 215gr Hybrids and 210 VLDs, this week will be 185gr Berger LRBT's at 3300fps. The larger 30 cal bullets just dont seem to stabilise very well in the 10 twist barrel, so hence we are now going to the 180's. Thanks for all the options. The 6PPC is a great short range cartridge,not because it has super BC bullets,or Lapua/Norma brass,etc. It is intrinsically extremely accurate-if it goes through the same hole,velocity is irrelevant. While 1000y brings in more factors,perhaps,sheer accuracy is always desirable,and at a real premium if wind vagaries can be substantially reduced,as fast shooting 'runners' manage especially in low winds.And the 6BR/Dasher has more accuracy than most. Supersonic,low recoil,accurate ...what fits these criteria when there is minimal wind effects ...and ...errr ... 'dashes' the big boomer hopes? The 6xc is one of those "magic " cartridges Bruce....its just shoots , no matter what you do with it. Its just like a .222 , 6ppc , 6br , 6.5 x 47 ......it just shoots. Get hold of Vince,s and try it. cheers, the heavy gun looks certainly very stable.. I was forgetting that the sequence of fire is fast a furious within a "condition" rather than slow and steady - quite different to F Class - an if memory serves me right, its about group size rather than getting the group into the Ten or X ring anywhere on the target face. So I understand the need for fast, stable accurate calibre that don't offer a great deal of recoil making the repeat fire / target acquisition process slower. I think that ballistically you're always going to be best with a bullet of the highest BC possible, but the trade off will be the better performing bullets are shot in heavier (relatively) calibre's. Machine gunning a seven or 30 cal is not going to do anything for your group size. But as there is no calibre limit, do you have to send em down as fast as possible…..? Having seen loads of superb groups shot with larger calibre guns (7's, 30's and 338's) which all offer high end BC bullet use, could you re think the "delivery to target process" and slow things down / fire in same condition during the time allowance? Its probably been muted before so apologies if I'm rethinking the wheel.. Slow deliberate fire with a large calibre could work in places where it's calm - but Diggle? New Diggle members often think - '1000 yards? - that'll be a 338'. They soon learn. The issue with 'chasing' the same wind conditions with relatively slow fire (any cartridge) is that wind reading is made even more difficult by the lack of flags on the bullets flight path,30-35 moa above the line of sight! Once the mind set clicks from 'the wind is the problem,lets counter it with momentum '(big calibre,magnum,high bullet weight,BC ,velocity etc) to '"it's really changes in the wind that are the problem-let's try to avoid changes (shoot fast)",a whole new set of choices comes in. Given the basic ballistic requirements are met-aerodynamic stability to target-then fast gun handling,and accuracy on target become the desiderata. Of course,it's never clear cut-the light recoil shoot fast runners run a risk of getting caught by an unadjusted wind change,and maybe a handling lapse,the slower,more deliberate chasers choose the more difficult problem of wind judgement,and loss of accuracy from their big sticks. Clearly some ranges,and definitely some wind-lack of- conditions will tend to favour one tactic over another,and there may be just a little variation between shooters as to preferences/confidences. Left jab or haymaker swing? Dainty Dasher or Heavy Smasher? As Vince says,typically, the heavy wheel is reinvented individually,but soon/usually gets more balanced. I only mentioned 338 as I recall Dave shooting a damn small group with his 338 a few years ago in pretty blustery conditions at a fly shoot - wasn't it circa 1.5 inches when the rest of us were shooting 2" plus at the same distance with all kinds of exotic calibre's. I'm sure that most rifle/cartridge combinations can be accurate providing the best components are used and put together properly. However, it's generally easier to shoot low-recoiling rifles that are heavy enough to tame the recoil. Large cartridges can set up accuracy-killing vibrations in light rifles. I've seen some great groups shot at 1000 yards with 338s but rarely will a 338 shooter put in a string of small groups - which is what is need to win. Incidentally, Dave's group - 1.152 inches is still a record for the Fly Shoot. Vince if money wasn't a consideration what spec /calibre rifle would you go for? Definitely a 6mm Dasher for Heavy Gun. Bruce and Tony are definitely on the right track with their heavy 6BR. I have a nice video of Ian Dixon demonstrating how to 'run a gun' - I've sent it to Mole-e30 - maybe he'll put it up on UKV. Earlier in this thread people were saying " wait until Norma make dasher brass" etc why? Surely no one shoots virgin brass in a comp rifle? Everybody fire forms there brass before hand? As a dasher shooter all I do is false shoulder 6br brass load with about 29.5/30g of your chosen powder and shoot it, if you are running in a new barrel you can kill 2 birds with one stone if you like. The life of a 6mm dasher is around 1500 rounds so a hundred or so cases should do for the barrel, as long as you don't try to thrash the granny out of it and you have some nice tight dies/chamber.